Innovator, living on the cutting edge, always interested in the ‘new’ – famously successful, notoriously offending. Who was Steve Jobs born to be? 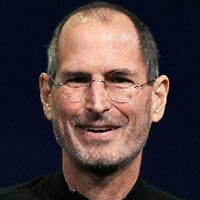 The founder of Apple Computers now the most valuable company in the world, Steve Jobs was the visionary and the charismatic inspiration for some of the most amazing technological products of the last decade. His company has literally changed the world. What was it that led him to such great heights of business and personal financial success? What was it that he was harbouring that eventually led to his untimely death?